Thank you to everyone who attended my most recent community meeting at Christ the King School in person or online to learn more about the upcoming I-440 project. Several TDOT officials and consultants shared substantive information about the scope of the project and answered concerned residents’ questions. This is going to be a large-scale, long-term project, and it is very important to me for everyone to be fully informed about what to expect in advance. If you were unable to attend, the entire Feb. 22nd public meeting was live-streamed and is available to be viewed on my Facebook page. 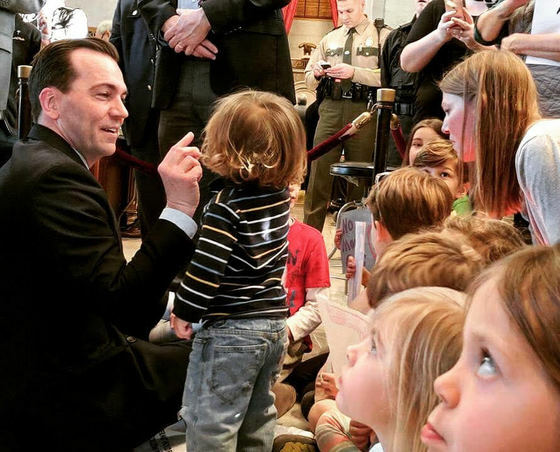 Thank you to all the children and concerned parents who joined us at the State Capitol last Monday to show your support for common sense gun safety legislation and opposition to NRA-fueled bills. Keep up the great work! An overwhelming majority of Tennesseans support common-sense gun safety laws, and the numbers continue to grow in the aftermath of the tragic events in Florida. Unfortunately, the supermajority running our state is focused on increasing the number of firearms in more public places, making them more readily available, and facilitating their sale without background checks. They are even trying to arm our children’s teachers. Like many of you, I am sick and tired of the nonsense. All of our children deserve to feel safe in our neighborhoods, community, and especially our schools. My Democratic colleagues have introduced legislation that is more in line with what Tennessee families want, and we need your support. I look forward to marching with all of you on March 24th in Nashville. On February 22nd, Sen. Lee Harris and I delivered a letter to Governor Haslam asking him to sign an executive order requiring any ISP doing business with the state to comply with the principles of net neutrality. This request came on the heels of our introduction of the “Tennessee Net Neutrality and Internet Consumer Protection Act,” HB1755, and HB2253, both of which I am scheduled to present to the House Business & Utilities subcommittee on Tuesday at 3:00pm. Five governors have already signed related orders, but Haslam has said he will not sign an order to protect Tennessee consumers and small businesses. Last week, a House Education subcommittee passed our “Teacher Residency Program Grant Act,” HB2447, out to the full committee after I presented the bill and the subcommittee heard persuasive testimony from Dr. Barbara Stengel. As we emphasized to subcommittee members, this legislation would cost-effectively help our state address two issues. First, it would provide vital in-classroom training for teaching candidates, and second, it would assist schools with their RTII staffing needs. Due to the fiscal note on the bill, it is imperative for the Governor to include the program in his final budget. Please share your support for this bill with the governor. Sen. Dickerson and I introduced the “Opportunity to Earn Act,” HB1680, to prevent the state from suspending professional and occupational licenses if one has defaulted on his/her student loans. Prior to presenting the legislation to the House subcommittee, a bill with similar language was passed so I took our bill off notice. As of now, the other bill is being held up in the state senate by Republican leadership. The substance of “Tennessee Mental Health Parity and Addiction Equity Act,” HB1244, a bill that I introduced with Senator Briggs to ensure that our state’s insurance providers’ comply with federal laws, is gaining traction on both sides of the aisle. We remain optimistic that legislation will move forward. After receiving favorable commentary, our bill to exempt first-year professionals from the state’s professional privilege tax, HB46, was placed ‘behind the budget’ by the House Finance subcommittee. Help us share information by forwarding this edition of Working for You to friends and family and encourage them to SIGN UP for this e-newsletter and other updates. Also, be sure and follow #TeamJRC on Twitter at @JRClemmons and Facebook at @johnrayfortn. Reminder: If you are visiting us at the State Capitol this year, please remember that our legislative offices and committees have moved to the Cordell Hull Building at 425 Fifth Avenue North. My office is located in Suite 424, and all committee rooms are located on the first floor.